Now that its presidential election nominee Pranab Mukherjee is busy campaigning for the July 19 election, the Congress-led United Progressive Alliance (UPA) has got down to finalising its candidate for the Vice-President�s election to be held next month. While names of few possible candidates have begun doing the rounds, one thing is certain that it is not yet time for incumbent Vice-President Hamid Ansari to pack his bags. 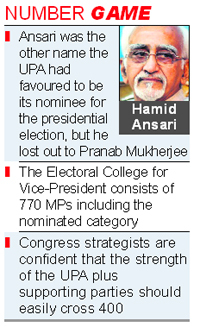 Sources in the Congress told The Tribune that Ansari is among the persons who would be considered for the post. 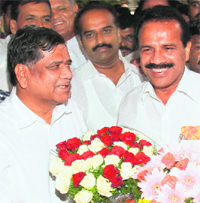 The long drawn-out leadership battle in Karnataka ended here today after a beleaguered Sadananda Gowda stepped down as Chief Minister to make way for Lingayat leader Jagadish Shettar. �Bring five new students and get Rs 25,000 as prize money.� This is the incentive that some engineering colleges in Punjab offer to their teachers. There is also a warning: 'Failing, you can lose your job'. This perhaps underlines a new trend: while the Punjab Technical University boasts of 108 colleges under its wing, the seats it offers seem to go abegging. The police have arrested the owner of the house in which the parents of four-year-old Mahi, who died after falling into an abandoned borewell in front of their house last month, were tenants. The police had registered a case against Rohtash Tayal under Sections 304, 188 and 336 of the IPC. Since then, Tayal had been evading arrest and had also applied for bail. Over 400 tourists and locals trapped at the Chang La in Jammu and Kashmir's Leh district following a massive landslide were rescued today by security forces after a 12-hour operation. Official sources said the tourists were returning after visiting Pangong Lake. They got stuck at Santak � 50 km from Chang La � on the Leh-Pangong road in Durbuk block. Over $1-billion Indian naval deal for 16 multi-role helicopters is being dragged into a controversy by a European consortium by taking an unusual step of �directly writing� to Defence Minister AK Antony sometime back against its American rival.